Out of Soil: How much land is in your food? 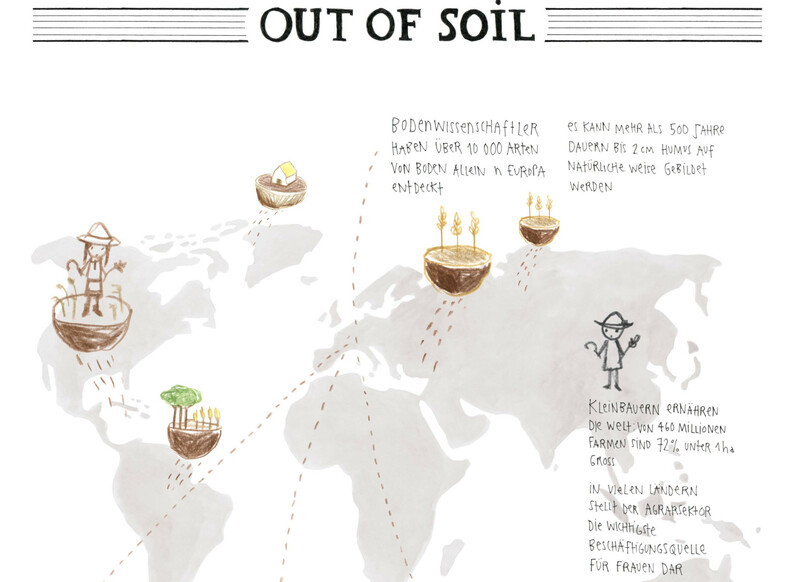 Out of Soil is a performative project by Myriel Milicevic and prozessagenten and brings to attention the correlation of land use, farmers’ rights and the question ‘How much land is in your food?’. Our soil is under pressure. Growing consumption and demand for resources take a toll on the soil — urbanisation, intensive farming, erosion and land grabbing are only some of the manifold consequences. Soil as matter is as much affected as the lives of people who have farmed for generations. Out of Soil examines these different aspects in a playful action. Out of Soil: made from soil / not having soil. Each visitor gets Soils Stamps, which are printed at the Soil Press Station with self-made soil paint. The Soil Stamps resemble food stamps, thus reminding us that food can only be produced in exchange for other resources. When a visitor consumes food or beverages, we stamp the Soil Stamps accordingly. The Out of Soil Map illustrates the issue of large-scale land acquisitions: the buying of large pieces of land in developing countries, by domestic and transnational companies and governments. These transactions have long-lasting consequences for the local and regional agriculture and ecosystems, for farmers and the provision of the local population. We will stamp the Out of Soil Map, depending on what the visitors consume. Upon entrance the visitors are questioned regarding their relation to soil. Thereupon each visitor gets a sticker that displays his or her personal Soil Profile. The stickers are to be worn on the clothing. They might serve as a starting point for conversations among the visitors. Myriel Milicevic explores the hidden connections between people and their natural, social, and technical environments. These explorations are mostly of a participatory and playful nature and stimulate thinking about possible alternative systems.